It is not often that Mike Tyson declares himself morally outraged by what he has just seen at a sports event. But after the Ultimate Fighting Championship title fight between Conor McGregor and Khabib Nurmagomedov in Las Vegas on Saturday night, the boxer who once bit off one of Evander Holyfield's ears tweeted his profound shock at the behaviour of the participants. And there was plenty to be offended about. With McGregor lying prone in defeat in the ring, his Russian opponent had vaulted the top of the cage and dived into the crowd, apparently keen to continue the bout with members of the Irishman's team. Meanwhile, with attention diverted, a couple of the Russian's mates had climbed into the ring and attacked McGregor. 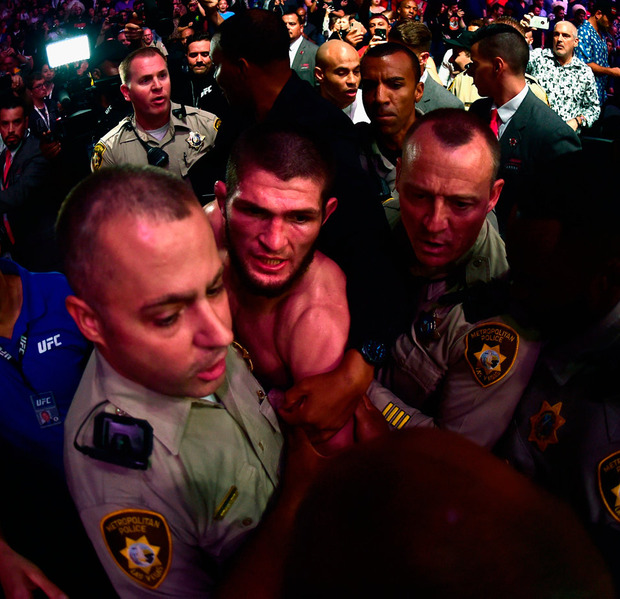 In the mayhem that ensued, three members of Nurmagomedov's entourage were arrested, though subsequently released after McGregor declined to press charges. In its seemingly pre-planned explosion of punches and kicks, the post-fight scrap resembled the invasion of Marseille by Russian hooligans during Euro 2016. The odd thing is, however, that anybody should have been surprised. Despite the public statements issued by the sport's presiding figures, despite the withholding of the winner's purse and the announcement of impending disciplinary action, this was, after all, a UFC promotion. And the unscripted brouhaha was just the natural consequence of a sport which has become a financial behemoth through the systematic promise of unhinged violence. This is a business built on its continuing ability to monetise bloodlust. Go to a UFC event and the possibility of danger tantalises. The cage in which fights take place, as if the audience needs to be protected from participants, offers potent hint of a dark underbelly of unhinged aggression. Never mind that the fighters are reared on the self-control of martial arts, what much of the young, computer-game literate audience turn up for is the hope of witnessing something primordial. In the person of Conor McGregor, those who run UFC happened upon the ideal figurehead for their enticing cocktail of skill and danger. A brilliant athlete, but publicly unhinged, he has become the master of the art of trash-talking. It might have been borrowed from boxing, but his bragging and blarney have reached new levels of provocation. In the lengthy build-up to the fight, in the pursuit of pay-per-view sales, he had done everything from questioning his opponent's bravery to attacking his team bus with a metal camera dolly. Instead of recognising the pantomime behind McGregor's sneer, Nurmagomedov evidently took it to heart. Which, for the bankers of UFC, was the perfect response: now it was personal. Which is why the hand-wringing from those in control of the sport in the aftermath of Saturday's shenanigans is so contemptible. None of them had stepped in to tone down the pre-fight nonsense. Nobody sought to defuse the growing animosity between the fighters. What happened in Vegas was the result of marketing. The truth is, for the UFC moneymen, as the footage of the unscheduled post-fight action was shared across the globe, this was manna.